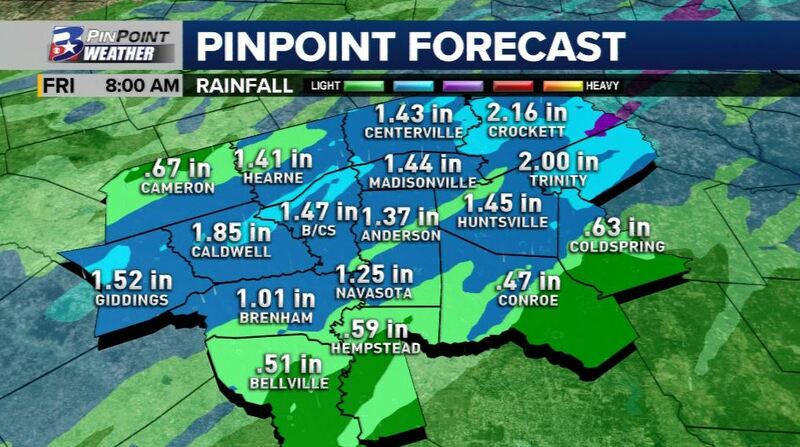 BRYAN, Tex (KBTX) - Our next bout with strong storms in the Brazos Valley may wait until many of us are sleeping. Worth noting: isolated thunderstorms are possible this afternoon, mainly along and north of Highway 21. Any storm that does develop will have plenty of fuel, possibly becoming severe quickly. The main threat for any severe storms in the afternoon will be for very large hail (1.5”+) or a brief tornado. As of right now, we’re not expecting much, if any, of this activity this afternoon, but it is still worth being alert through dinner time. The impacts overnight keep the hail and switch to a mainly wind and heavy rain threat. 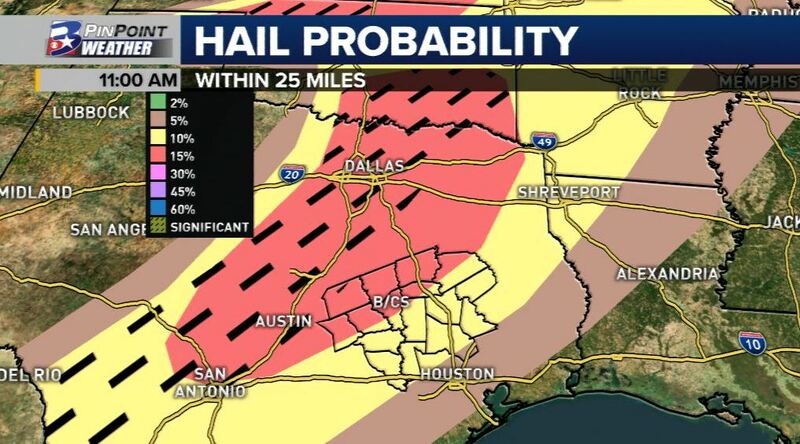 The hail threat is highest tonight just off to our west (the ‘hatched’ area seen in the graphic above). Either way, if you have an easy way to cover valuables, like your vehicle, it wouldn’t hurt to do so tonight. Wind and heavy rain will be the impacts most will experience tonight. Wind gusts to 40mph+ are likely, with 60mph+ winds certainly possible as the main line of storms moves through after midnight. Heavy rain is likely as well, potentially dropping up to 2-3 inches widespread before sunrise Thursday. Some minor flooding will be a possibility in the heaviest storms. Timing: Afternoon storms could pop up any time after midday, but are slightly more likely in the 3-7pm time frame. For most, scattered showers and a rumble here and there are the most action to be seen during the day. 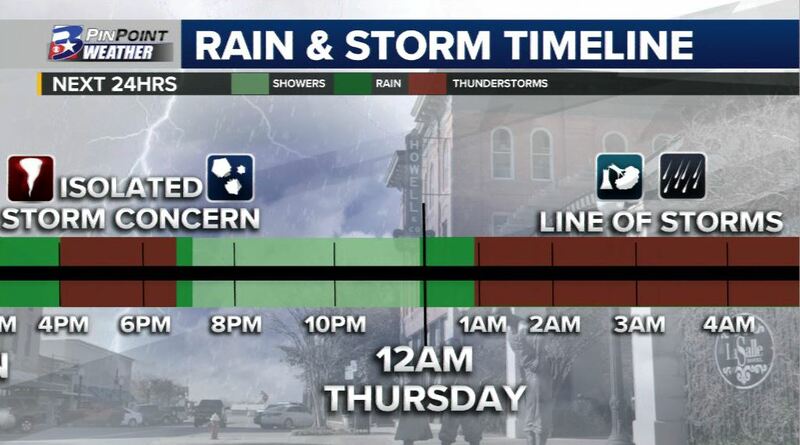 Our more widespread storms arrive after midnight, and as of right now, look to be clearing the area from northwest to southeast by sunrise Thursday. Eventually, we’ll see sunshine Thursday afternoon with only a stray shower or storm possible as the system exits. Bottom line: have a way to receive weather alerts in the overnight should severe weather pop up in your area. Latest is always available online and on your PinPoint Weather app.